Weekly Winner: Silken, Spicy, Sumptuous … Swine! So in my mind there is very little better than pig, noodles, and peanut sauce. For me, that’s the trifecta of tastiness. Guess what?? I found all of that in one recipe with some nice, bitter greens added to it. Full disclosure, I didn’t have collard greens for this recipe so I substituted lacinato kale, which was awesome. I’m guessing the collards would have been great as well. This silky, spicy dish needs a hearty green and any would work just fine. Peanut Rice Noodles with Pork and Collard Greens comes from Bon Appetit and is quick, easy and totally delicious. Seriously, whichever green you like, buy it and make this dish! Heat oil in a large skillet over medium. Cook pork, breaking up with 2 forks, until nearly cooked through, about 5 minutes. Add ginger and garlic; cook, stirring, until softened, about 3 minutes. Add collard greens (or kale) and cook, stirring occasionally, just until wilted, about 2 minutes. Add sauce and noodles and bring to a simmer; cook, tossing occasionally, until sauce is reduced by half and coats noodles, about 3 minutes. Season with salt. There’s something about cold noodles that I just love. They’re addictive and refreshing all at once. Usually you find cold noodles in some sort of Asian variety, but if we’re being totally honest with each other, I’ve been known to dig into cold left-over Italian-style pasta as well. A noodle is a noodle, right? 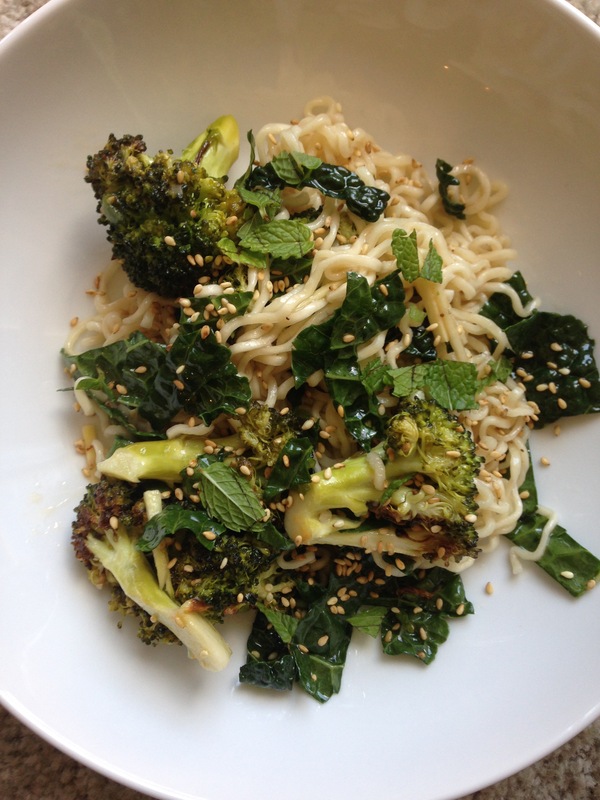 Cold Sesame Noodles with Broccoli and Kale from Bon Appetit was a happy find for me for several reasons. First of all, they’re cold noodles – and not just any noodles, but ramen noodles (bonus!). Secondly it has roasted broccoli. I am happy to eat broccoli in any way, shape or form (including raw) but roasted is definitely my favorite. Finally, it served as yet one more way I can get hubby to happily eat kale. I think the zip of the vinegar and spice of the sambal oelek has a lot to do with it, but I’m taking my victories however I can. As the temperatures continue to rise here in Chicago, rest assured this will become not only my go-to lunch, but also an awesome side dish to take along to concerts, picnics and cookouts. Preheat oven to 450F. Toss broccoli with grated garlic, sambal oelek, 1 Tbsp vinegar, and 1/4 cup oil on a rimmed baking sheet; season with salt and pepper. Roast, tossing occasionally, until tender and browned in spots, 20-25 minutes. Meanwhile, whisk scallions, ginger, sliced garlic, 1 tsp salt, 1/4 tsp pepper, and remaining 1/2 cup vinegar and 1/2 cup oil in a large bowl. Add kale; toss to coat. Let sit at room temperature at least 15 minutes and up to 1 hour. Cook noodles according to package directions. Drain; rinse under cold water. Add noodles and warm broccoli to kale and toss to coat. Divide among bowls and top with mint, sesame seeds, and more scallion greens. Weekly Winner: Super Cozy, Super Tasty, Super Healthy -But What Is It? I crave structure. I adore lists and make them with wild abandon. I organize, strategize and categorize literally everything in my life (yeah, I know…I’m working on it!) But I truly do love everything to have a place and to have a place for everything. So then this recipe happens. 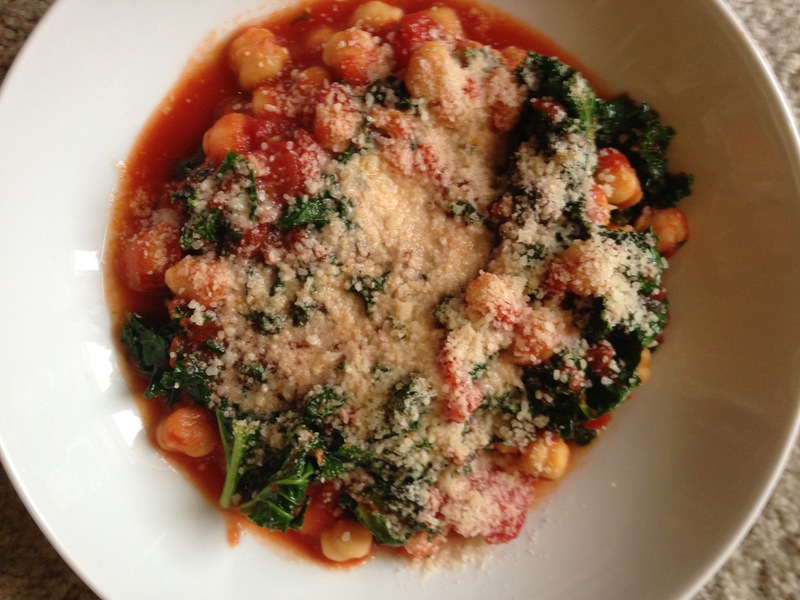 Chickpeas and Kale in Spicy Pomodoro Sauce. It’s fabulous. It’s easy. It’s healthy. I’m just not exactly sure what it is! Is it a soup? Is it a stew? Perhaps a side dish? No, far to hearty and complete for a side dish. Whatever its supposed to be, it was my lunch recently and I seriously enjoyed the heck out of it. I think the only thing I would possibly add to this is a piece of crusty bread along side it. Although honestly, I didn’t miss it. This is a bowl you want to curl up in. It is incredibly satisfying and complex-tasting and I would make it again in a heartbeat if I could only find under what category I filed the recipe! Seriously, I had to look up the recipe online as I could not locate mine. I’ve checked soups, side dishes, lunches, vegetables…nada. Luckily I remembered pulling it from Food & Wine magazine. See, I told you I need to work on it. Enough of my problems and hangups. Make this dish. Whatever it is. Because all that matters is it is one big bowl of tastiness. In a large saucepan, heat the olive oil over low heat. Add the garlic and cook, stirring occasionally, until very fragrant but not browned, about 5 minutes. Add the tomatoes, fennel seeds, crushed red pepper and a generous pinch of salt. Cook over moderately low heat, stirring occasionally, until the tomatoes break down and the sauce is thickened, about 25 minutes. Stir the kale into the sauce and cook over moderately low heat, stirring occasionally, until wilted, about 3 minutes. Stir in the chickpeas and cook until heated through, about 3 minutes. Season with salt. Spoon into bowls and garnish with torn basil and marjoram leaves. Top with finely grated pecorino and serve hot. Beans and greens have been friends forever. Combinations include: collards, escarole, spinach, kale and chard on the green team and cannellini, kidney, and pinto for the bean team. Put them together and you’re guaranteed a healthy and generally tasty meal or side dish. However, for it to be really memorable, things needed to be switched up in this old standard. A recipe I found in Bon Appetit did just that by changing the beans and adding pasta and sausage. That’s a guaranteed winner in my book! There are a couple of things that make Sausage, Greens, and Beans Pasta unique. First: the shape of the pasta – paccheri – which is like rigatoni on steroids. I’m talking huge, short tubes of pasta goodness. Second: it trades out the standard beans for chickpeas (always a fan favorite in this house). Finally, there’s the crumbled fried rosemary sprinkled on top. Enough of me blabbering on — just trust me. This dish is special. It’s got a great combination of textures and flavors and is the perfect thing to curl up to prepare for the craziness of the holiday season. 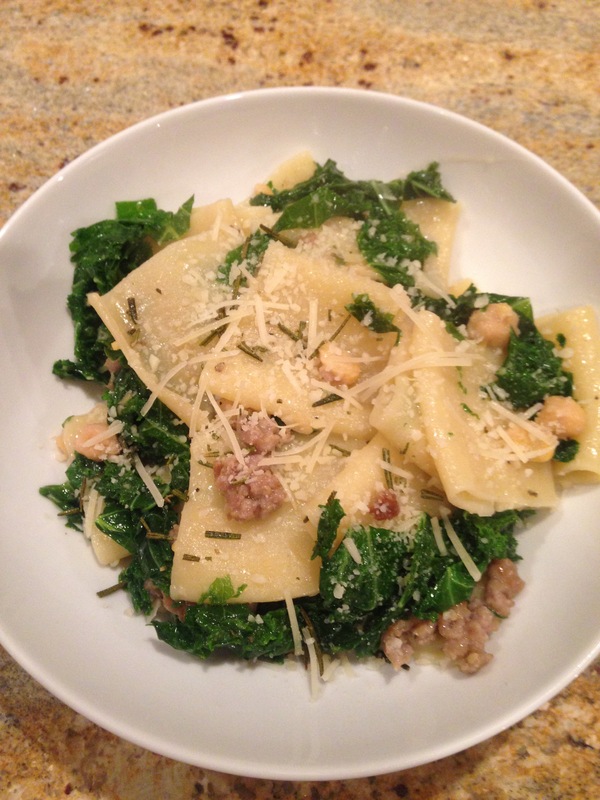 Using a spider or a slotted spoon, transfer pasta to pot with chickpeas and add kale and 1 cup pasta cooking liquid. Cook, tossing often, until kale is wilted, pasta is al dente, and sauce is thickened, about 4 minutes. Add another ¼ cup pasta cooking liquid, then gradually add ½ cup cheese, tossing until melted and dissolved into a luxurious, glossy sauce. Thin with more pasta cooking liquid if needed. Season with pepper, and more salt if needed. Add butter and toss to combine, then mix in reserved sausage and chickpeas. Ramen noodles. I gotta admit, I love the things. I’ve used them in place of regular pasta for spaghetti-and-meatballs-gone-Asian. I make a mean ramen noodle salad. I love them in soup, and they got me through college as-is with just a bit of cheese sprinkled on top. The one thing I never thought of using them for; however breading. That is until now. Crispy Ramen-Crusted Chicken with Asian Slaw comes from Southern Living Magazine. Honestly I was a bit skeptical about this since you use the noodles raw. However the chicken turned out amazing. The noodles “cooked” just enough while browning the chicken and the chicken itself stayed amazingly moist. And just in case you’re feeling a little guilty about eating chicken fried in ramen noodles (you shouldn’t be — it’s tasty!) 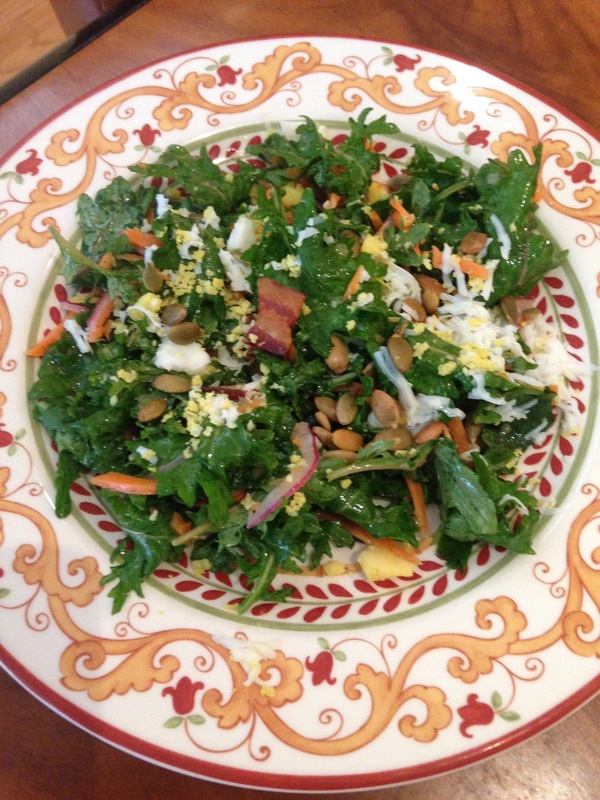 there is a fabulous Asian kale salad that goes with it. The salad, with its honey-soy-lime dressing is the perfect light zesty accompaniment to the rich chicken. This dish, in a word, is a “keeper”. And it gives me a great excuse to stock up on more ramen! 1. Toss together kale, cilantro, green onions, and carrots. Whisk together lime juice, soy sauce, honey, and 1 tablespoon olive oil in a small bowl; pour over kale mixture, and toss to coat. Set aside while preparing chicken, tossing occasionally. 2. Break ramen noodles into pieces. Process ramen noodles, seasoning mixtures from ramen packages, ginger, and cayenne pepper in a food processor until combined, 1 minute. Transfer mixture to a shallow dish, and set aside. 3. Place each chicken cutlet between two sheets of heavy-duty plastic wrap, and flatten to 1/4-inch thickness, using a rolling pin or flat side of a meat mallet. Dip each cutlet in eggs, and dredge in ramen mixture, pressing to adhere. 4. Cook half of chicken in 2 1/2 tablespoons hot olive oil in a large skillet over medium until golden brown and done, 2 to 3 minutes on each side. Place on a wire rack in a rimmed baking sheet, and keep warm in a 200° oven. Repeat procedure with remaining chicken and olive oil. 5. 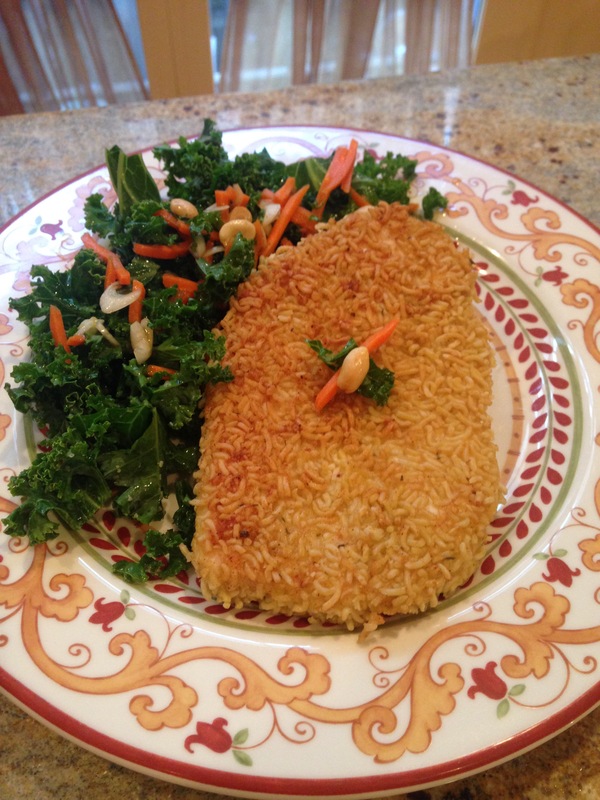 Sprinkle peanuts over kale mixture, and serve with cutlets.